A journalist is being charged with criminal trespass and “engaging in a riot” while covering the latest arrests near the Standing Rock reservation in North Dakota. Jenni Monet, 40, told the Los Angeles Times she clearly identified herself as a journalist and was still arrested, then held with other women arrestees for around seven hours in a metal cage in a parking lot at the Morton County jail. Police “asked me to leave,” and she attempted to do so, Monet said in an interview Friday. “I was walking away, I was halfway down the hill, and they still arrested me,” she said. The arresting officer did not read Monet her Miranda rights, she said. She was loaded onto a school bus and held for seven hours with other women, “stripped down to our long johns,” in metal cages in a Morton County jail parking garage. Late Wednesday evening, Monet was transferred to an indoor cell with five other women. 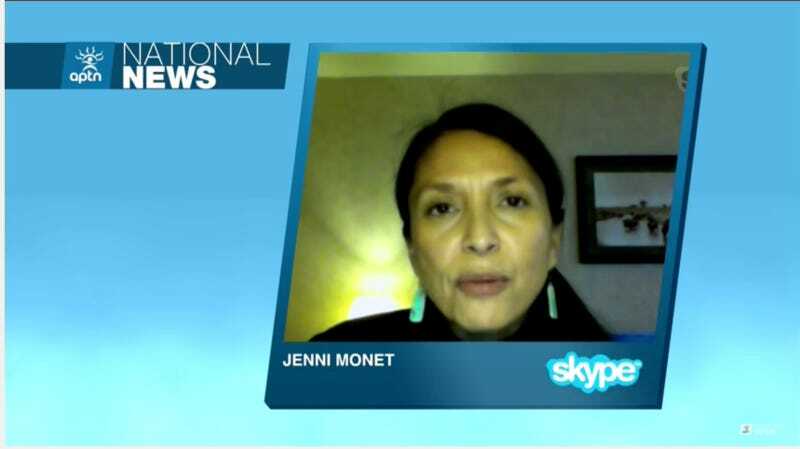 Monet’s arrest comes after Donald Trump signed an executive order paving the way for Dakota Access to legally complete their pipeline, and after the Bureau of Indian Affairs announced plans to deploy agents to physically remove remaining demonstrators from the land. BIA agents reportedly visited Sacred Stone Camp, which is on private property, for an “assessment,” and announced imminent plans to remove anyone who couldn’t prove longterm residency in Cannonball, North Dakota.